You know you are a writer when even your dreams are consumed by characters… not you. By plot-lines and magic and fictional lands and mystery. I love dreaming for that. However, even awake I am consumed by these plots and ideas. I will start daydreaming at the oddest of times. Have these mini conversations in my head with my characters. Begin to think about a plot and then drift into it. Car rides are the best time I find for this. Not driving of course. I would never recommend that. But being a passenger, yes, the perfect time to daydream into the realm of the fantastical. I wonder what is it about writers? That we are consumed by these ideas and plots and characters? I have to wonder… what do other people daydream about? People? Events? Work? I do know we all daydream about many things. Maybe writers simply do it More. Maybe it is ingrained within us. A fundamental element to our process. Almost anything can trigger an idea. Like a name. That name is Awesome. What a great character name it could be… and the next thing I know I have lost track of the conversation because I am thinking about the name and where I might use it. I can see why people see me as absentminded and flustered. Half my mind is present. 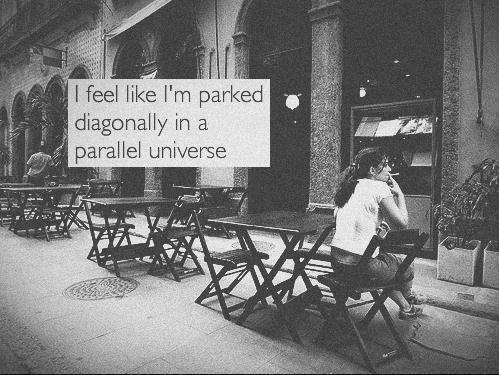 Half my mind is in a parallel dimension.